Fresh, high quality and less drip. This is Skruf Slim Fresh White and it comes with a long lasting mint flavor and slim white portions that drip less! Skruf Slim Fresh White Portion is a mint snus from Skruf with white slim portions that drip less, but still give less drip! The flavor is mint with a hidden aroma of citrus and tobacco. 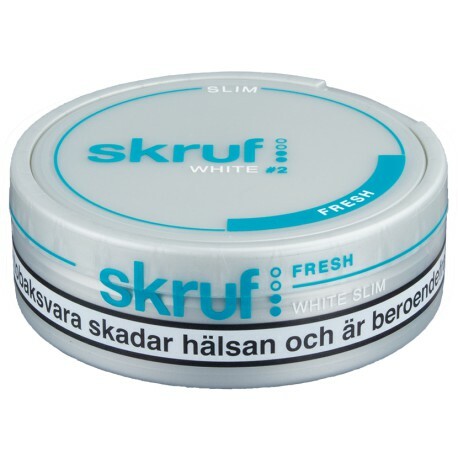 This Swedish snus has a more normal nicotine, so it is the perfect day-to-day companion for us who just want something fresh and not too strong. If you are looking for a day-to-day companion, then we got the perfect Swedish snus for you. It has a more mild nicotine content or normal, a fresh snus that isn't too strong!